the leading worldwide provider of innovative and comprehensive sample lifecycle management solutions for the life sciences industry. Our customers experience best-in-class solutions for automated storage systems for compounds and biospecimens, biorepository and biobanking services, pre-clinical and clinical sample storage consumables and instruments, cell therapy cryopreservation and cold chain solutions, to global sample preparation and analytical lab services. Learn how Brooks Life Sciences supports researchers through the basic research process, from experimental design, collection, processing, data generation, analysis and sample storage. From sample acquisition and storage to high-throughput compound screening, we provide flexible, modular solutions that offer the security and reliability that assure accurate, on-time order fulfillment, reduced costs, and high throughput. Brooks supports biobank organizations need for quality hardware and software that not only preserves their inventory of unique biological samples, but makes retrieving and testing samples easier for researchers. Brooks Life Sciences offers consulting services that identify the appropriate testing, sample processing, and data analysis methodologies for preclinical studies. We also provide support for the collection, processing, and analysis of those samples, plus storage for archival purposes. Brooks Life Sciences partners with biotech and pharmaceutical customers to provide clinical trial sample management and processing that ensure the safety, integrity, and regulatory compliance essential for FDA review. From cell collection to therapeutic administration, Brooks Life Sciences has the cryopreservation storage solutions, transport handling devices, and storage containers that support the protection, monitoring, control, and auditing of cells throughout the cell therapy workflow. Brooks Life Sciences supports the development of molecular diagnostic research with comprehensive sample management, storage, and analytical services that remove variables, reduce risk, and yield richer study results. Consolidated intelligence on sample management at your finger tips. 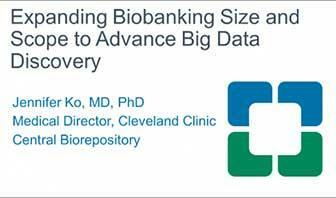 Learn about how Cleveland Clinic is partnering with Brooks Life Sciences and embarking on an enterprise-wide initiative to accelerate its biobanking capacity, leveraging its clinical volume and disease expertise and building a state of the art, 21,000 square-foot structure biobanking facility. Hear more about what clinical translational specimens we have that could contribute to big data discovery and what resources are needed to build an infrastructure to enhance researchers' study of human tissue samples and advance personalized medicine for an array of conditions.